Being a professional tennis player is no joke. In fact, it takes a lot of effort, sweat, hard work and initial financial support as well. But in the end, having some luck, lots of talent and being surrounded by right people, it can pay off big time. Literally. We checked some data and listed three highest-paid tennis players worldwide in 2016/2017. Some of them also rank among the top five earners in the sport. Standing on the top for 12th straight years is 36 years old Roger Federer, who recently claimed his record 20th Grand Slam title. Between June 2016 and June 2017 he earned around $64 million from endorsements and about 6 million U.S. dollars in prize money. 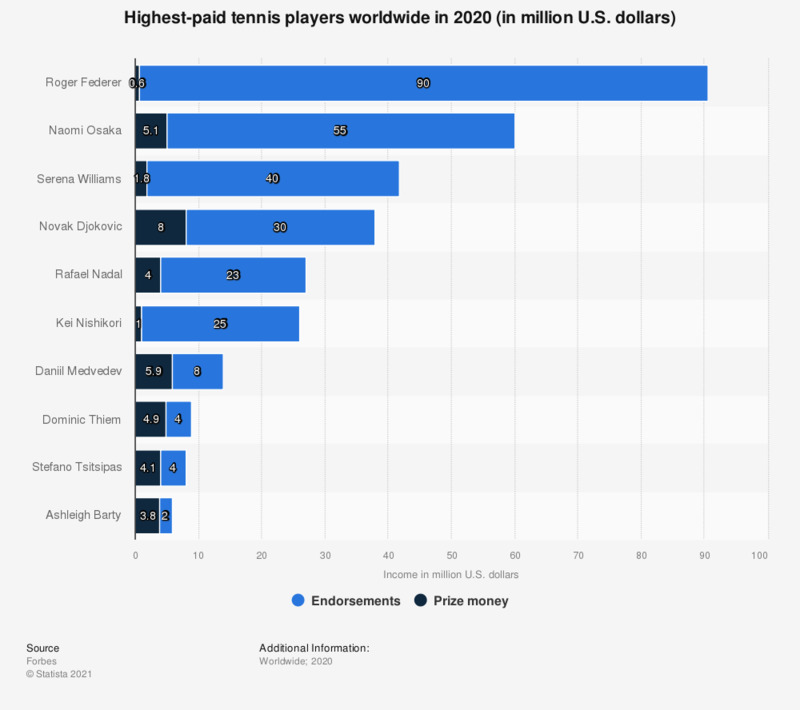 Earning the most of any athlete worldwide from endorsement is no surprise, since his remarkably constant run near the top, as he is also constantly ranked among the top players in the ATP Rankings throughout his career. Swiss player won in all around $108 million in prize money which is negligibly small toward his off-court earnings from appearances and endorsements. His latest pact that runs more than five years is with pasta brand Barilla and is expected to net him for around $40 million. Some of his other sponsors include Wilson, Mercedes, Rolex, Credit Suisse, and many more. The biggest benefactor is, however, the deal with Nike that contributes roughly $10 million a year. Thanks to his ability to sell out venues, he also commands the biggest fees for exhibitions, with a price tag of more than 2 million U.S. dollars. Ranking second is, of course, one of tennis’ Big Four, Novak Djokovic, earning around 37.6 million U.S. dollars from endorsement and $9.6 million on-court. He dropped to 14th in men’s singles tennis by the Association of Tennis Professionals (ATP), after a long spell out with the injury. The 12-time Slams winner earned in his career $109 million in tops by prize money. He was the first tennis player to earn $20 million on-court in a season. This was done in 2015. The prize money dropped from $12 million as he made it past the quarterfinals in just one Grand Slam since 2016 French Open. With that, he failed to earn the profitable bonuses that come with Slam titles. Djokovic extended his deal with Seiko at the end of 2016 through 2020. In May 2017 he also swapped Uniqlo, with whom he had a five-year sponsorship, reportedly worth around $10 million per year, for Lacoste as his apparel brand. Among others, he endorses Serbian telecommunications company Telekom Srbija and nutritional supplement brand FitLine, one of the newest partnerships was done in January 2018 with Asics. Japanese Kei Nishikori this time beat other two Tennis’ Big Four payers Nadal and Murray, ranking third on the chart. In 2016/2017, despite the lack of results at the biggest events, he earned around $33.9 million from endorsements and about 3.9 million U.S. dollars in prize money. Nishikori is currently ranked world No. 24 by the ATP. He is the only male Japanese tennis player ever to be ranked inside the top 5 in singles and won the first medal for Japan in men’s tennis in 96 years at the 2016 Rio Olympics, where he was third. His status as the top Japanese player results in endorsements that include many well-known sponsors, such as Nike, Jaguar, Wilson Procter & Gamble and Tag Heuer. In 2016 has extended his supply deal with Uniqlo and some sources suggest the deal is worth at least $50 million, with the term running to the Tokyo 2020 Olympic Games. You can check the full list of top 10 highest-paid tennis players worldwide in 2016/2017 down below. Not bad, huh?